One of the really fun things about traveling in Iceland is running into things that you really don’t expect to in the middle of nowhere. On a super-windy and chilly morning, we sadly left the Westfjörds and headed into North Iceland without too many immediate highlights to look forward to in our first day’s path of travel. When our first few attempts at diversion yielded mediocre results, we chalked up the day to travel; sometimes you just need to get from here to there, right? As an impressionable youth in the 1960s, he worked on the American base in Keflavik and fell in love with country-western music. Upon his return to Skagasatrönd, he started recording his own Icelandic version of the genre and eventually opened his own successful restaurant/bar/radio station/museum/live music venue that is still open today. What a trip it was to walk into an Icelandic version of an American country-western saloon!From the neon signs to the Lincoln Log walls, from the reindeer antlers over the bar to the large collection of album covers (Kenny Rogers, Dolly Parton, Johnny Cash, Willie Nelson) and various US and Icelandic license plates displayed on the wall, it was all as authentic as you could reasonably expect in the middle of nowhere, Iceland. After downing an ice-cold pint of Viking Lager and devouring a tasty pizza, we headed upstairs to the museum and perused all the nostalgia collected over the cowboy’s forty-year career in country music. Long-fringed jackets, cowboy boots and acoustic guitars shared pride of place with a gold bust of the Icelandic Cowboy himself. 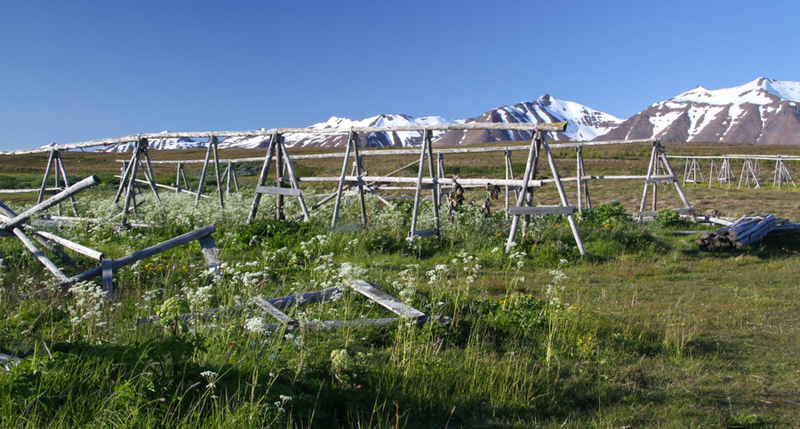 To get to Hrísey, we caught a ferry from the town of Árskógssandur for the short 15-minute ride from the mainland and then headed straight to the nature trails that we hoped would lead us to the heart of the ptarmigan’s nesting grounds. As we set out on the 5 kilometer trail, we kept a close eye out for the well-camouflaged, ground-dwelling ptarmigan, but we were often distracted by the other birds that we encountered. 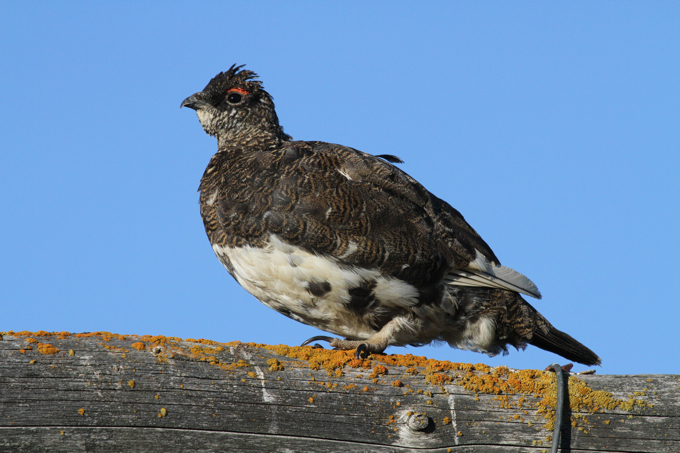 We were able to get good shots of many birds, including the Arctic Tern, Whimbrel, Black-Tailed Godwit and Golden Plover, and so we weren’t too bothered when we read a sign saying that the best time to see the ptarmigan was in the fall. The trail was really pretty, though, and, with the snow-covered mountains of the neighboring fjord looming beyond and the rare sight of a few coniferous trees, we almost felt like we were hiking in a mountain meadow of the Canadian Rockies rather than a small island in the north Atlantic. With our walk quickly coming to an end, the ptarmigan was still eluding us. Just as we returned to the main road to catch the ferry, our anticipated subject flew right in front of us and landed on a wooden rack used for drying fish. While it wasn’t the natural background that we were hoping for, he was indeed quite tame, and he happily posed from his perch while our cameras clicked away. We headed back to the harbor to catch the ferry, pleased that we had completed the mission of our trip and with memories of a nice walk on a charming island to boot. After a pleasant day that included driving around North Iceland’s coastal peninsulas, strolling through the quaint villages of Sigulfjördur and Ólafsfjördur, we set our sights on finding a campground for the night. Headed eastward on Highway 1, Iceland’s Ring Road that circumnavigates the country, we passed up several campgrounds that were marked on the map in an effort to stay near Godafoss, one of the area’s premiere waterfalls. 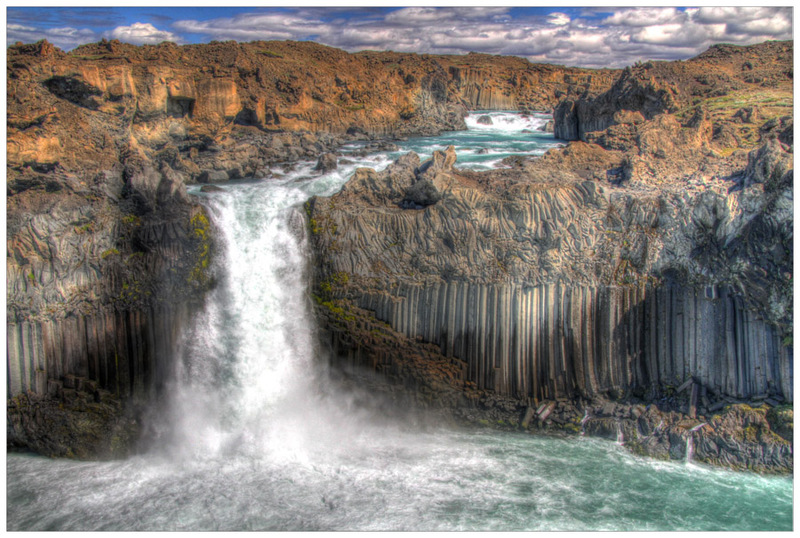 The name of this fall means “Waterfall of the Gods,” and it played an important role in Iceland’s religious history. Throughout its early history, pagan beliefs and rituals were prevalent on the island, but in the year 1000 AD, Iceland held a national assembly, in which the chief lawmaker declared Christianity to be the official religion. On his way back to his home near Godafoss, the lawmaker threw his pagan relics over the falls, and the rest is history. Located just a few meters off the Ring Road, we pulled off to have a look at Godafoss even though we knew we would be back the next morning when we weren’t quite so hungry and tired. As it was nearly midnight, we had the waterfall mostly to ourselves. There were a couple of RVs that looked like they had set up camp in the parking lot for the night, and some photographers strolled the riverbank opposite us pausing here and there to set up their tripods and take different shots. Back on our side of the falls, we were amazed at how close we could get to the powerful currents. While beautiful to see, we found Godafoss a rather challenging subject to photograph. At this time of night, the sunlight was just hitting the top of the falls, creating a lot of contrast in the scene. The falls are also quite horizontal, and there doesn’t seem to be a good way to frame the scene for a pleasing, frame-filling composition. We shot anyway, keeping in mind the option to crop later on the computer. The next morning, we returned to the Godafoss around 11:00 am. This time, we parked at the end of the falls and headed up the opposite side of the river. At this time of day the falls were more evenly lit, and we found that we liked the perspective from this side a little better. The most interesting thing for us, though, was watching the sheer amount of people that arrived at the falls in the hour that we were there. Tour bus after tour bus pulled up and unloaded passenger after passenger, making it a bit challenging to compose pictures without people in them. By the time we were ready to leave, the entire north bank was covered by more tourists than we felt like we had seen put altogether in the Westfjords! It was really quite a shock, and we were eager to escape the crowd. For what it’s worth, the southern side of the river where we were was relatively empty, so if you can’t time your visit for midnight, be sure to walk that side of the falls if you prefer to enjoy it somewhat to yourself. Regardless, Godafoss is still worth a visit. Check out our photography tips for shooting Godafoss here (but please forgive my absolute butchering of pronouncing its name!). From there, we headed to Aldeyjarfoss, another highly recommended waterfall in the area. This waterfall is 42 kilometers down a well-maintained gravel road just beyond Godafoss, and our time there was a completely different experience. We packed a picnic lunch and carried it in on the five-minute trail from the parking lot. The falls were absolutely beautiful, and, to our delight, we had them completely to ourselves. Unlike any other waterfall that we have ever seen, its surrounding cliffs are made up of a layer of columnar basalt that seems to have melted and twisted before reaching the top. The large rock formations at the mouth of the fall funnel all of the water of the wide river above into a single powerful downspout, and the churning and spray this creates in the pool below is quite mesmerizing. The whole scene looked rather unreal, as if it were taken from the movie set of Jurassic Park rather than something that could really exist in nature. After shooting away, we sat down to gawk at the scene and enjoy our sandwiches, happy to be away from the swarming masses of Godafoss. It just goes to show that making a little more effort to see something almost always pays off, often in more ways than one! Taking in the amazing photos and informative narrative, I have two random thoughts ~ probably the only 2 Chicagoans enjoying cool temperatures this summer AND can you say the names of these town & falls? Keep the good stuff coming!